Cheesy Cauliflower Casserole will become the favorite of veggie haters for sure. Kids and husbands will definitely ask for more! This makes a perfect holiday side dish as well. We’re updating the recipe with a video below. It is super easy to make this comforting casserole. Watch the video and see! 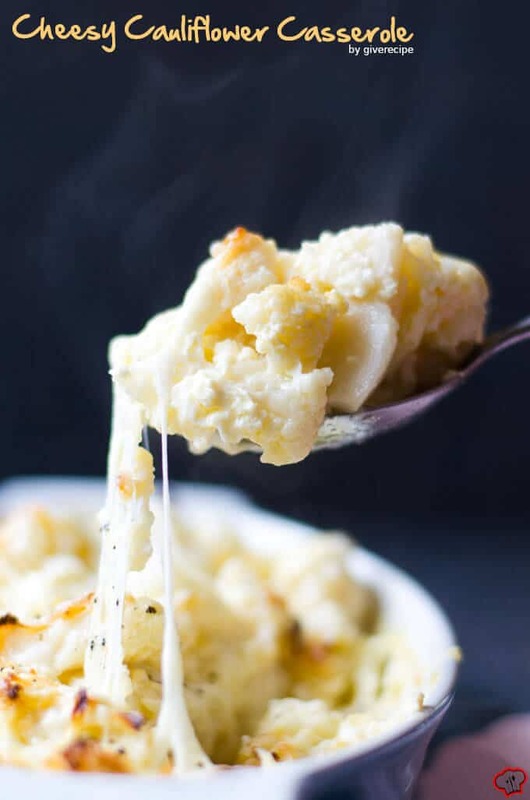 Cheesy Cauliflower Casserole is what you are looking for if you have a cauliflower hater in your family. I’m saying this because I know it. No, it’s not my 20-month-old son who hates cauliflower. He loves all vegetables including cauliflower, spinach and even celeriac. My husband feels he is left out by his family when my precious son and I eat a vegetable dish heartily. Seeing something with cauliflower on the dinner table used to be one of his nightmares. Not any more! I’ve found the cauliflower recipe even my husband asks for. He loved it as much as Unstuffed Cabbage Casserole. I don’t need any additions, I love cauliflower as it is. I love to snack on it even raw when preparing it for the recipe. Have you seen my Tangy Raw Cauliflower Salad, which is another recipe that appeals to the whole family? I know not everyone is like me about eating cauliflower. Most people need additional flavors on it. I think cheese is the best food to make any vegetable taste more edible for the veggie haters. That’s why with no doubt I think this vegetarian Cheesy Cauliflower Casserole is the dish that everyone will love. Try and see yourself! What is your go-to recipe with cauliflower if there is a picky eater in your family? Would love to hear your suggestions. Please share it in the comments section below. BTW I’m planning to try Cheesy Cauliflower Muffins next time. Hope it becomes a favorite too. This is a very easy-to-make recipe. If you have leftover steamed or cooked cauliflower, it gets even easier and quicker. No worries if you don’t though. It takes about 10 minutes to steam or boil it. If you have a steam basket, just place the small cauliflower florets in it and steam for 10 minutes or until tender. You can toss in a half lemon in the basket to avoid the bad smell. If you don’t have a steam basket, just fill a large pot with water, toss in the florets and bring it to boil. Let it simmer for about 10 minutes and drain. It’s better to transfer the cooked cauliflower florets into very cold water to stop cooking. Throw a half lemon with its zest into the boiling water along with the cauliflower florets (See the video). You won’t feel any bad smell as a result. Then prepare the sauce with milk, egg and cheese. Coat the florets with this mixture, combine with cheese and bake in a casserole dish. A tasty casserole requires cheese. A generous amount of it. I used parmesan, but you can use cheddar or mozzarella too. You can even use a combo of your favorite cheeses. The more cheese the better! This Cheesy Cauliflower Casserole tastes great when hot, so heating the leftovers before serving is recommended. May 2016: I’ve updated the amount of salt and black pepper upon some readers’ comments saying that they find the amounts too much. 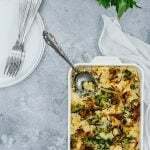 If you are looking for a non-vegetarian recipe that still contains cauliflower, you should check out our Cauliflower Casserole with ground beef, which is a very comforting winter casserole. 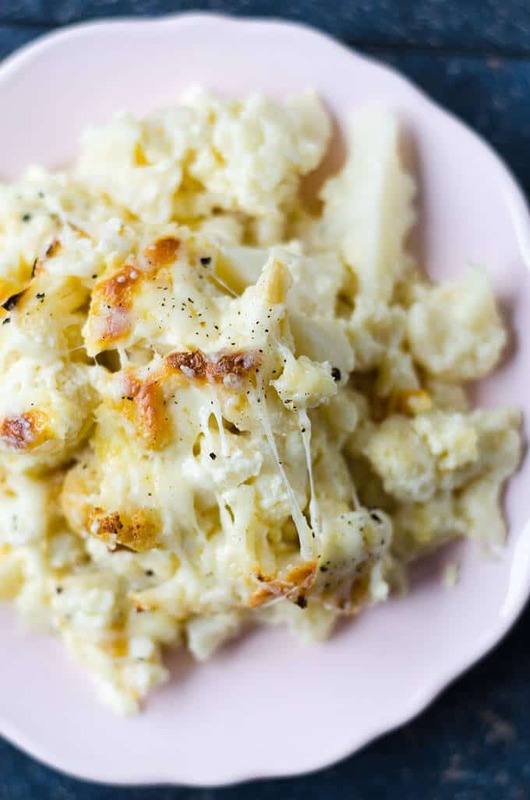 But if you want a lighter casserole that is still tasty, give this cheesy cauliflower casserole a try. This makes a wonderful side dish for holiday dinners too. This is definitely healthier than the ones with lots of carb. As for what to serve with this casserole, I can’t think a better match than a big bowl of Winter Green Salad. A scrumptious cauliflower dish loaded with cheese becomes everyone’s favorite! Steam the cauliflower florets in a steam basket for 10 minutes. If you don’t have a steam basket, then fill a large pot with water, toss in the florets and lemon. (See the video). Bring it to boil. Let it simmer for 10 minutes or until tender. Drain and transfer the florets into very cold water. Drain and put aside. Whisk egg, milk and olive oil. Add in flour, salt, cumin and black pepper. Whisk until smooth. Fold in 1 cup parmesan. Toss in the steamed cauliflower florets and coat them well with this sauce. (See the video). Transfer it into a casserole dish and bake for 40 minutes. Remove the casserole from the oven, throw the remaining parmesan over it and bake for another 5-10 minutes or until the cheese melts and gets golden. You can easily turn this into a gluten-free recipe by using a gluten-free type of flour like rice flour or cornmeal. Found and made this for my family. Wasn’t really expecting much, like those bad mac & cheese recipes you spend an hour making only to toss it out. WOW was I wrong. This recipe was excellent. A- for ease, A for flavor. Considering it is cauliflower after all, I was surprised my family ate this and went back for seconds. Hi Kim! I’m so happy to hear that you family loved it! This is the recipe that made my husband start to love cauliflower! Have you tried freezing before or after baking? Trying to find some good veggies recipes that I can freeze. Thoughts? Thanks!! Hi Megahn, I’ve never tried freezing it myself but I think it will freeze well. Thanks Jessica for sharing your experience! Chopped onion and panko topping additions sound brilliant!